Harmon Killebrew ended his Hall of Fame career as the second-greatest home run hitter to ever play in the American League and although he has since been surpassed by several modern hitters, he remains a reliable favorite in the hobby. 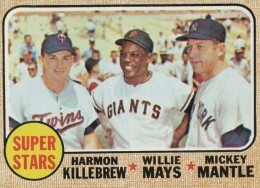 This top list brings together the best Harmon Killebrew cards for collectors of every budget. Shop for Professionally Graded Harmon Killebrew Cards on eBay. Debuting at 17 with the Washington Senators, Killebrew would end up hitting the most home runs ever by a right-handed hitter in the AL. He also hit 40 or more home runs in a season an impressive eight times and was selected to ten All-Star games. Besides the obvious similarity to his last name, Harmon Killebrew earned the nickname "The Killer" because of his ability to nearly destroy a baseball with his powerful swing. He held many distance records for home runs and is one of only four players to ever hit a ball over the roof of the old Detroit Tigers' Stadium. Twins collectors can find a few memorable cards of Killebrew that didn't make the top ten documented below. 1967 Topps features a duo card with fellow Twins slugger Bob Allison as they share the moniker the "Twin Terrors." His last card with the Twins can be found in 1975 Topps. 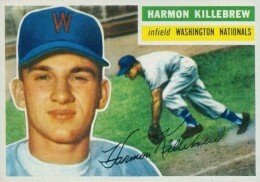 Although he did briefly play for the Kansas City Royals, Killebrew never had a card honoring his time with the team. Other notable options include a 1991 Donruss Diamond Kings puzzle commemorating Killebrew and fans of "cards that never were" can look to 1994 Topps Archives The Ultimate 1954 Set. When chasing the cards of home run-hitting royalty, as Killebrew is, it is easy to focus strictly on card values in the process of building a collection. In constructing this top list, value is an important factor, but so is the artistry of the card designs as well as the collector's ability to procure the cards. Harmon Killebrew's 1970 Topps card is a memorable one as it shows the home-run-hitting legend examining the tools of his trade. Towel on his shoulder, Killebrew is surveying his bat options and picking just the right one. Along with being a beautiful card, its price is also budget friendly. Killebrew shares one of the rarer and more valuable cards in the 1955 Topps Doubleheaders set with Dodgers pitcher Johnny Podres. Harmon is featured on the front of the card and when the top part is folded down, it shows Podres delivering a pitch. The pictures are drawn in a way in which both Podres and Killebrew share the same set of feet. A large stadium can be created if all the cards in the set are lined up in reverse order. The most famous home run race of all-time found Roger Maris battling his teammate Mickey Mantle for Babe Ruth's single season home run record during the 1961 season. The 1962 Topps card that honors the event reminds us that Killebrew finished third in American League home runs that year. Collectors can also find another memorable Killebrew three-photo card in the 1962 set (#316), which shows him giving a big swing. So many of Harmon Killebrew's cards feature him swinging at the baseball that when you see him playing a little defense, the card stands out. The photograph on his Exhibits card could be from his days at third base and he also spent time playing first base and left field. 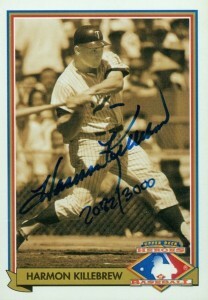 Collectors can find a second Exhibits card for Killebrew in his more-traditional batting pose. 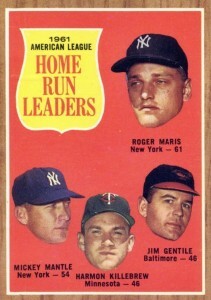 Minnesota Twins collectors can look to 1961 Topps to find their first Killebrew card featuring the team's name. The Twins, of course, were the Washington Senators until the completion of the 1960 season when they moved to Minneapolis. 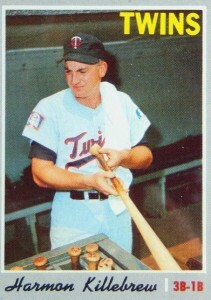 Killebrew is shown on his card without a baseball cap, as were nearly all of the Twins players in the 1961 Topps set, because Topps did not have updated photos showcasing the new logos. 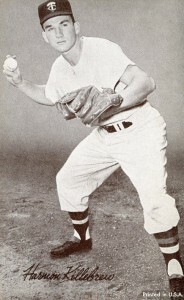 Topps typically took photos of players during spring training with and without the caps in case the player was later traded and those photographs without the caps were used for the Twins players in 1961. Killebrew offers a nice smirk on his 1958 Topps card, making it one of the more distinct card images from his days with the Senators. What he is smirking about, however, remains a mystery as it wouldn't be until the 1959 season, his sixth in the league, that he would become the offensive dynamo that would make him a legend. 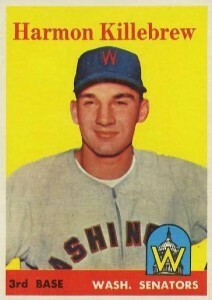 The same smirking photograph is also used on his 1959 Topps base card. Although card #8 on this list featured a great collection of players, Killebrew's 1968 Topps Super Stars card with Mickey Mantle and Willie Mays is really on another level. Over their three careers, the HOF trio totaled over 1,700 home runs and six MVP awards. In Low Series packs of 1991 Upper Deck, Killebrew was one of three players featured on a four-card Heroes of Baseball insert set. Along with Gaylord Perry and Ferguson Jenkins, Killebrew signed 3,000 copies of his card and it is one of his first certified autographs. 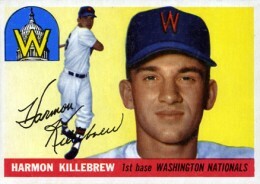 Harmon Killebrew's career didn't get off to a roaring start and outside of his prospect rookie card from the previous year's set, it was a little surprising that Harmon was featured again in the 1956 Topps set. 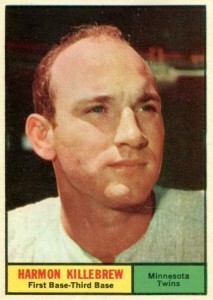 He would not appear at all in 1957 Topps, which gives collectors fewer options for early Killebrew cards. His 1956 card features two possible backs, one on gray paper and one on white. Speaking to the quality of subjects in the set, the Harmon Killebrew rookie is actually the third most valuable rookie card from 1955 Topps. Although he sits behind Roberto Clemente and Sandy Koufax rookie cards in terms of value, highly graded copies of Harmon's rookie can command $500+ at auction. 1956 Topps BASEBALL #164 Harmon Killebrew PSA 6 . The double header should be number 1. I am a big Killebrew collector and this card is the hardest to find in psa 7 or higher. I have an autographed 3 x 5 picture postcard from Harmon. He was then with the Senators. He was living at an apartment complex in Bellview, VA. It was between 1960-1962. Our family lived in the same courtyard and my Dad made sure to get an autograph. Also have a TCG BB card. 2005 LEAF LIMITED HARMON KILLEBREW AUTO AUTOGRAPH JERSEY # 1 1 3 25 TWINS RARE!